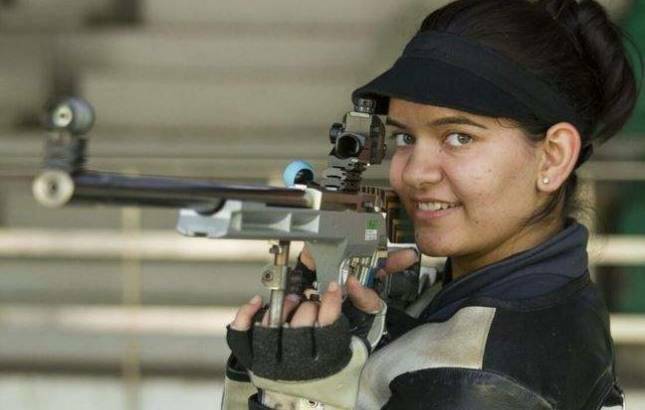 Indian shooter Anjum Moudgil clinched a silver medal in the women's 50m Rifle 3 Positions event at the ongoing ISSF World Cup in Guadalajara, Mexico. It was Anjum's first World Cup medal as she battled windy conditions to shoot 454.2 in the 45-shot final to finish behind former junior world champion China's Ruijiao Pei (455.4). Another Chinese Ting Sun claimed bronze, finishing with a score of 442.2. This was India's eighth medal in the competition and the first silver after having won three golds and four bronze medals already, for their best ISSF World Cup performance by far. India thus remained on top of the medals tally with eight medals, while China is in second with two gold, two silver, one bronze. Anjum remained in medal contention from the beginning of the final and at the end of the 15-shot kneeling position stood third behind Ruijiao and Slovakia's Ziva Dvorsak. She pulled into the lead after the second 5-shot prone position series, which followed the kneeling position and was 0.9 points clear of German world number one Jolyn Beer at the end of it. After the 15-shot prone series, Anjum was still in the lead. However, after the 10th shot of the last standing series when the first two finalists out of the eight were eliminated, Anjum had gone down to fourth position. A brilliant 10.8 in the 41st shot took her up to second and she maintained that position finishing with scores of 10.2, 10.1, 9.5 and 10.2 to secure the first World Cup medal of her career. In the Men's 25m Rapid Fire Pistol, it was heartbreak for 15-year old Anish Bhanwala, who stood third after the first precision round with a solid 294 and a real chance to make it amongst the top six finalists. He had looked comfortable in the second rapid fire round on Thursday - beginning with a solid 99 and following up with a 97 but scores of 7,9,10,8,8 in the final series of five shots pulled him down to seventh place. Anish ended with 578, the same score as sixth place qualifier Zhaonan Hao of China, but with one lesser 10 than the Chinese. Neeraj Kumar, the second Indian in the fray, also had a similar last series to finish with 569 and in 13th place.